Been working on this critter on and off for over 2 weeks now. The pics aren't that great, what can I say I'm just not that good with cameras. Better ones coming once I get the chance to do this with some daylight around. Despite the rather crappy pics (red seems impossible to photograph) I'm rather happy with this little critter. First off because I finally finished him, after putting it off for over half a year. There was just something about the complexity of the mini that made me hesitate every time I started working on it. It was still quite a challenge though; tough to hold, many overlapping layers and colour areas, loads of details and almost a year since my last Tyranid in this colourscheme. Still, all great practise for my Forge World Trygon. Still about 2,5 weeks left before the plastic one hits the stores, so I can still avoid feeling silly for not having painted if before that comes out. I really like painting Nids because it allows for a more organic, or fleshy approach to painting. There are no tight edges, sharp, industrial corners of mechanical bits. 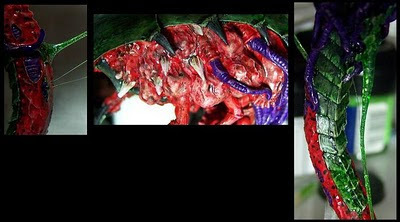 Nothing wrong with those of course, but every now and then a Tyranid makes for a very fun and different project. 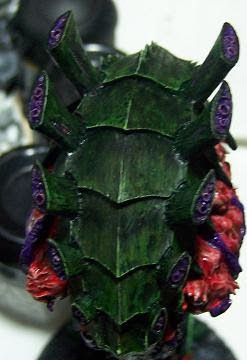 I'll do a small tutorial on the effect on the carapace in a couple of days, this as I got so carried away with this mini that I utterly forgot to take wip shots. Here we have a couple more detail shots, apologies for the ugliness of the middle pic. Damn flash is all over the place, then again the problem usually lies with the user and not the equipment right? If anybody is interested I'll also put a little ichor / Nid slime tutorial together in the next couple of weeks. 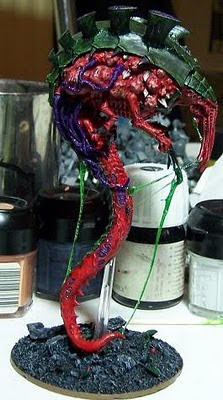 And the last couple of shots which, thankfully, do show a bit more of the depth of the reds and the tentacles. In hindsight I do have the feeling that the chestcrest was probably just intended as part of the normal chest organics, but the added contrast does make it look more sinister. 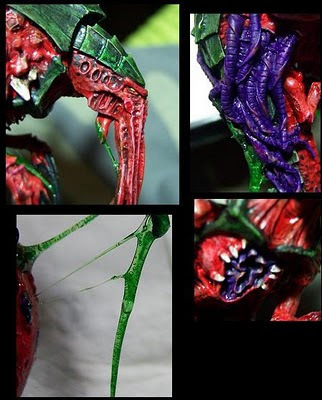 And let's face it, a corpse and dna-sucking, grim reaper-wannabe Tyranid needs to look dead sinister. And that does it for this update, more stuff coming probably on Christmas. Should have some free time then and I do have to come up with a mini for a contest, prep the Trygon etc.